- Publisher From the beginning there have been principled men alongside unprincipled ones in our government. Focusing on the lives and careers of 13 American leaders from Washington to Clinton, Marvin Olasky systematically examines the connections between personal faith and political decisions, offering indisputable evidence that private morality does indeed affect public policy. A serious work of historical scholarship, this succinct book guides Americans who are seeking their way in the moral fog of the new millennium. 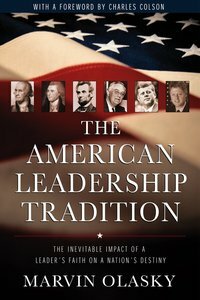 About "The American Leadership Tradition"
From the beginning there have been principled men alongside unprincipled ones in our government. Focusing on the lives and careers of 13 American leaders from Washington to Clinton, Marvin Olasky systematically examines the connections between personal faith and political decisions, offering indisputable evidence that private morality does indeed affect public policy. A serious work of historical scholarship, this succinct book guides Americans who are seeking their way in the moral fog of the new millennium. Marvin Olasky is Professor of Journalism at the University of Texas at Austin and a Senior Fellow at the Acton Institute for the Study of Religion and Liberty. He is the author of more than a dozen books of history and policy analysis, and the editor of "World, " a weekly news magazine from a Christian perspective. He has been an adviser to George Bush since 1993.